As the book began to unfold, a large amount of interviews began to accumulate and diversify, and it became a critique of the untold effects of the wars on the common people. History books tend to focus on the major events; this is echoed by the Chinese saying, “the success of one military general is brought about by tens of thousands of rotten human skeletons” (Yi Jiang Gong Cheng Wan Gu Ku). Lung's book proposes the opposite; she casts the focus back onto the forgotten ones with their and her own personal stories. The stories about her own family were intricately written and particularly moving. This was highlighted by the story of Lung Yingtai's older brother, who was separated from his mother when he was a toddler and never saw her again. Lung Yingtai finally met with him when she was in her thirties; she writes that she could immediately recognize that this man was her brother because he had their mother's eyes. The only memory he had of his mother was her perm hair. In his childhood, he often mistook women with perm hair as his mother whenever he was in need of a mother's tenderness. Such recollection would bring tears to the eyes of this grown man. Separation from family and forced displacement is often the unwanted but inevitable consequence during such chaotic times. The goal is to survive first and ask questions later, coupled with a high degree of helplessness and uncertainty. We may think that such thoughts bring a rather sour taste to the supposedly jolly Christmas season, but it is in fact woven into the Christmas narrative. We see it illustrated in the Holy Family's flight to Egypt, after learning that baby Jesus' life was in danger (Matt 2:13-18). Let us put ourselves into the scene and imagine what they were going through: although the birth of a child always brings joy, it is unlikely that a family would want to uproot themselves after childbirth, let alone flee their country. It was on rather short notice as well; there was no time to waste after the warning of the angel in Joseph's dream. No time to find the best route via Google Map. There was certainly no time to pack, and no opportunity to say goodbye to their relatives like Zechariah or Elizabeth. They were forced to hasten to a foreign country of which they knew nothing. 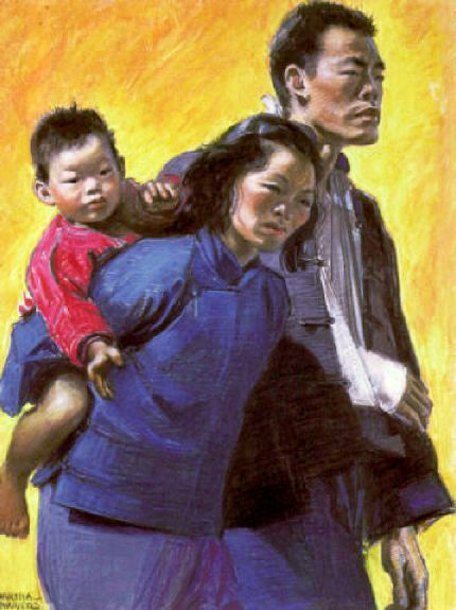 In short, they were refugees, and were not that much different from those suffering commoners described in Lung Yingtai's book. While it is true that Christmas is a joyful occasion, it is worth examining for what reason we ought to be joyful. It is certainly not because we all need an occasion to celebrate, to be joyful for joyfulness' sake. In the Holy Family's flight to Egypt, how can one remain joyful? It is a kind of joy that only manifests itself when we are with Christ. In a sense, we are joyful simply because we are with Christ Jesus, and not because the situation is rosy. It is not so much an endorphin rush of positive feelings, but rather a quiet contentment that despite everything, we are with Christ Jesus, which is the ultimate goal of our lives. While not many of us are in the position to put together just and appropriate policies to stop the cause of forced displacement, we can certainly provide some kind of hospitality and be in solidarity with those who are seeking refuge for whatever reasons; for in them we find the Holy Child who is fleeing from persecution.